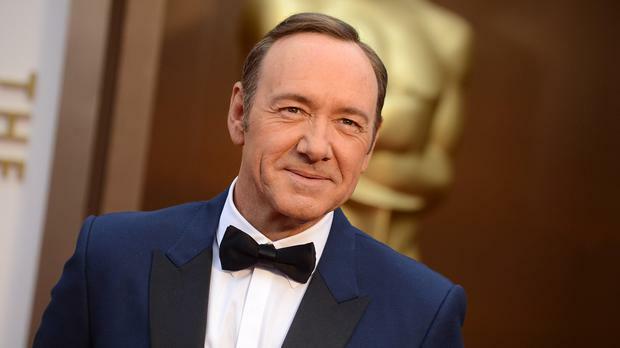 HOLLYWOOD star Kevin Spacey is due in Dublin next month for the Irish Film and TV Awards. The Oscar-winning actor, who plays Frank Underwood in cult TV show House of Cards and is a regular visitor to Ireland, is lined up as one of the big-name stars on the night. Co-host Simon Delaney let it slip during a recent interview that one of the stars in the famous Oscars selfie will be coming over. Although Delaney declined to comment any further, and organisers are trying to keep the whole guest list under wraps, Spacey is rumoured to be attending. He has been living in London for the past 11 years and is no stranger to Dublin. Spacey previously attended the Jameson Dublin Film Festival for a special screening of The Usual Suspects, the movie that won him his Best Supporting Actor Oscar. He is not the only big name expected. Also on the guest list for the April 5 bash are Michael Fassbender and Jamie Dornan, who are both up for awards. Fassbender is nominated for Best Supporting Actor for 12 Years A Slave. Dornan, who nabbed the lead role in 50 Shades of Grey, is up for Best Actor for TV drama The Fall. Taking place at the Doubletree Hilton in Burlington Road, the event is now in its 11th year. Some of the biggest players in TV and film are nominated in 40 different categories. It is one of the most glamorous events on the calendar, and more than 300 guests will descend on the hotel next to see who wins a coveted award. However, it is an expensive night out – non-members of the academy will have to fork out €302 for a ticket, while members will pay €242. RTE's Love/Hate has been nominated for eight accolades awards. This year saw Oscar-nominee Saoirse Ronan receiving her ninth IFTA nomination, for her role in Byzantium. And it is a family affair for Brendan Gleeson and actor son Domhnall, who will battle it out for the Best Actor gong for their roles in Calvary and About Time respectively.